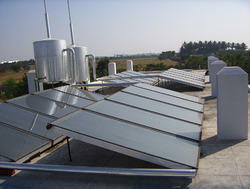 Providing you the best range of energy solar water heater for textile industry with effective & timely delivery. Being one of the market leaders in manufacturing and supplying this commendable Energy Solar Water Heater for Textile Industry we work hard to maintain its quality. Thus, we utilize the finest raw materials and advanced technology, as per the set industry guidelines. In addition, its performance, reasonable pricing and service life, make it highly praised and preferred in the market.